Do you know what to do if you, your family or staff have a needlestick injury when vaccinating or injecting sheep and cattle? 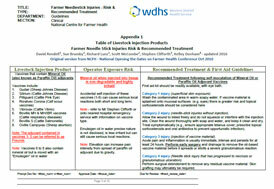 A new fact sheet put out by the National Centre for Farmer Health gives tips on first aid on the farm and treatment procedures for medical professionals for most of the common livestock products. Over the last few weeks, the National Centre for Farmer Health have seen numerous needlestick injuries, particularly with vaccines that use mineral oil as the adjuvant (irritant). It can have a very harmful effect on humans if it is accidentally injected, scratched or finds its way into your eyes or mouth. When using oil-based vaccines (such as Gudair, Vibrovax, Piliguard), ensure proper precautions. Always use one handed vaccine technique, restrain animals, remove needles with pliers and dispose of needles in an appropriate container. If injury occurs, seek medical attention and take a copy of Farmer Needlestick Injuries fact sheet along with the vaccine container. Read the Farmer Needlestick Injuries—Risk & Recommended Treatment below. (Put a copy in your ute, near your fridge and give to your staff and family).